The front porch is the welcome center of your home, a preview of what’s to come when stepping inside. No matter how small or expansive your porch is, you can give it style and character and leave a lasting impression on all who stop by. Whether you want it to be a place to relax and spend time or simply make a statement, follow our design tips to create a front porch you can be proud of! Choosing the right furniture for your front porch is the first step to setting the stage for its intended purpose. Do you want to be able to spend time relaxing there? Is it too small for furniture but you have a lawn that precedes the front door? Is it long and narrow? Is there enough room for a comfortable swing? Do you want to have a small table with barstools? These are all questions you should consider the answers to before deciding on the furniture. Not enough space for chairs on your porch? Consider creating a mini-seating area on the front lawn, just off to the side of the entryway. This could be a simple as two chairs angled towards each other to invite conversation. If you have furniture pieces that are the perfect size for your front porch but don’t match, consider a coat of exterior spray paint. This is one of the easiest ways to unify the look and bring in color to a space! 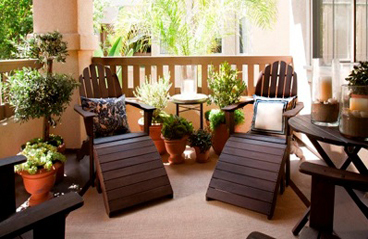 For example, maybe you have a white wicker swing, a table with a green base, and two wooden rocking chairs. With a little spray paint (the kind meant for each element you are applying it to), you can transform them into perfectly unified pieces! Your front porch can be welcoming both during the day and night. With decorative but functional outdoor lighting, you can keep the conversation going long after dark – and in style! Consider using an outdoor chandelier that will not only provide the right amount of light but in itself can show off your decorating style. No room for a chandelier? 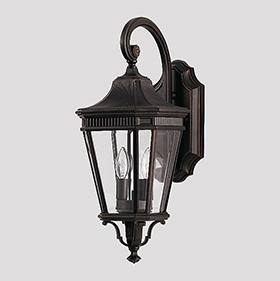 Try having matching outdoor sconces on either side of the front door in addition to the overhead light. Paint the front door a color that coordinates with the furniture you’ve chosen. Don’t leave the floor bare, the use of an exterior area rug can complete the look of the conversation area. Use hanging flower baskets in a cone shape to line a long front porch. Go beyond the porch itself and make sure your curb appeal is inviting and weed free. Line the pathway leading to the front porch with flowers or greenery. What would make you want to spend time on a front porch?